Okay, who doesn't like Fred Hembeck? As you may (or may not) have seen elsewhere, one of my regrets is not owning a Mantis page from her time in the Avengers. I have a Silver Surfer page by Ron Lim featuring her (which is very nice and I'm very happy with), but somehow I feel a tad unfulfilled here. 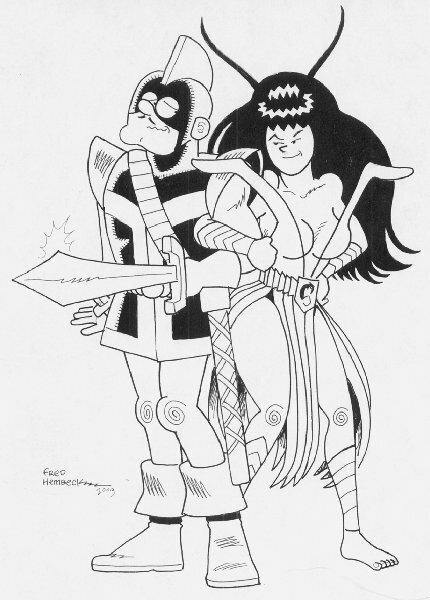 Cut to eBay in July of 2009, and this lovely image floating out there, by Fred Hembeck, who is one of those guys who just makes comics fun. I whipped out the checkbook (or the "Place Bid" button-pushing finger, in this case), and was more than overjoyed to pick this up. The real kicker for me is that it came straight from Hembeck - I hate and will rarely buy from "flippers" who get commissions or buy art solely for resale purposes, but I'm always happy to give the artists my money direct. Expect this to be framed and on my walls in short order. I do recommend watching for one of your favorites to come up in one of Hembeck's EBay auctions, or that you contact him direct about a commission. When I originally bought this piece and put this webpage up, I wrote here that "I am so tempted to commission an MTIO cover recreation!" Well, I didn't commission a cover recreation, but check out what I did commission!